No matter how the source disk is made available to the Add Feature wizard, whether using different network drives, mounting it locally, copying it to the local drive, etc., the error message is the same. A similar message is encountered when attempting to add the .NET 3.5 feature via PowerShell script. This is the first time you have encountered such an error building a new Windows Server 2012 instance for SharePoint 2013. 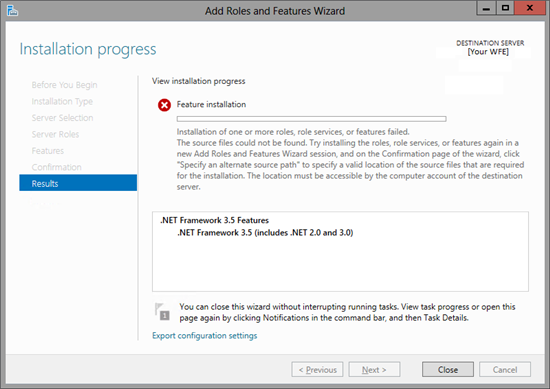 You last successfully created a new Windows Server 2012 instance in July 2014. Add the .NET 3.5 Framework feature and all its subfeatures. Many thanks to Steve at AskVG and to to my team's lead sysadmin for originally presenting and finding the solution to this vexing problem. All of these updates are associated with the MS14-046 security update of August 12, 2014. Only KB2966827 applies to Windows Server 2012.